Twenty-two McMaster University researchers today heard about their new research grants totalling $19 million from the Canadian Institutes of Health Research (CIHR). Filomena Tassi, Member of Parliament for Hamilton West – Ancaster – Dundas, made the announcement of the grants as part of a total of $145 million of grants to Ontario institutions, during a visit to campus. The projects cover a wide range of health research, from immunology and stem cells to obesity and patient care, among others. Michelle Kho, Gregory Steinberg and Jason Busse were among the McMaster grant recipients highlighted at today’s announcement. Kho, an assistant professor in the School of Rehabilitation Science, is working to address the common problem of leg weakness in ICU patients. Using a special bicycle that attaches to the hospital bed, ICU patients can gently exercise their legs. Kho will receive $1.98 million to support her research. Steinberg, a professor of medicine, is working to address obesity, which is an important risk factor for developing type 2 diabetes, cardiovascular disease and some cancers. Steinberg and his team will receive $950,000 in federal support. Busse, an associate professor of anesthesia, received $2.2 million, the largest of the McMaster grants. He is leading research looking at how cognitive behavioural therapy could improve patient outcomes from trauma surgery. The other McMaster principal investigators receiving grants were Darryl Leong, Zainab Samaan, Giuseppe Melacini, Dawn Bowdish, Brian Coombes, Wallul Khan, Lori Burrows, Andrew McArthur, Ali Ashkar, Kristin Hope, Karen Mossman, Catherine Hayward, Alison Holloway, Jeremy Hirota, Lesley MacNeil, Peter Kavsak, John Whitney, Alfonso Iorio and Mark Duffett. The total amount of national funding announced is $372 million. Twenty-two McMaster University researchers today heard about their new research grants totalling $19 million from the Canadian Institutes of Health Research (CIHR). Filomena Tassi, Member of Parliament for Hamilton West – Ancaster – Dundas, made the announcement of the grants as part of a total of $145 million of grants to Ontario institutions, during a visit to campus. “Thank you to all the researchers being funded today for your hard work and commitment to improving the health of your fellow citizens and the quality of the Canadian health care system,” said Tassi. “The people of Ontario are grateful for your research, which has the power to change lives.” The projects cover a wide range of health research, from immunology and stem cells to obesity and patient care, among others. 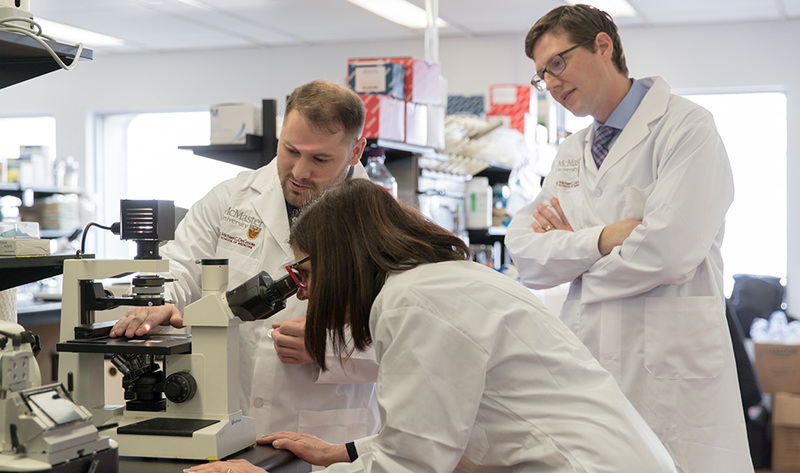 “This significant investment by the Canadian Institutes of Health Research will help McMaster researchers address many of today’s pressing health issues from antibiotic resistance and obesity to opioid addiction,” said McMaster President Patrick Deane. “Health research at McMaster benefits people here in Ontario and Canada, as well as around the globe as we work towards fostering a brighter world.” Michelle Kho, Gregory Steinberg and Jason Busse were among the McMaster grant recipients highlighted at today’s announcement. Kho, an assistant professor in the School of Rehabilitation Science, is working to address the common problem of leg weakness in ICU patients. Using a special bicycle that attaches to the hospital bed, ICU patients can gently exercise their legs. Kho will receive $1.98 million to support her research. Steinberg, a professor of medicine, is working to address obesity, which is an important risk factor for developing type 2 diabetes, cardiovascular disease and some cancers. Steinberg and his team will receive $950,000 in federal support. Busse, an associate professor of anesthesia, received $2.2 million, the largest of the McMaster grants. He is leading research looking at how cognitive behavioural therapy could improve patient outcomes from trauma surgery. The other McMaster principal investigators receiving grants were Darryl Leong, Zainab Samaan, Giuseppe Melacini, Dawn Bowdish, Brian Coombes, Wallul Khan, Lori Burrows, Andrew McArthur, Ali Ashkar, Kristin Hope, Karen Mossman, Catherine Hayward, Alison Holloway, Jeremy Hirota, Lesley MacNeil, Peter Kavsak, John Whitney, Alfonso Iorio and Mark Duffett. The total amount of national funding announced is $372 million.